This is a guest post by fellow blogger Nadia Jones. Do you have a great article or story about Cebu? See our Guest Posting guidelines here. First, we must pay tribute to the one that started it all. The first film to be shot in Cebu in Visayan was this 1938 talkie, which starred among others Ben Zubiri, Iyo Karpo himself. Unfortunately, the fledgling regional industry was put on hold after only two completed films with the oubtreak of World War II. My web sources don’t indicate whether Bertoldo Ug Balodoy is still extant or if it’s a lost film — but a revival would be a project of great historical interest, should any Bisdak film buffs take it upon themselves to restore it. 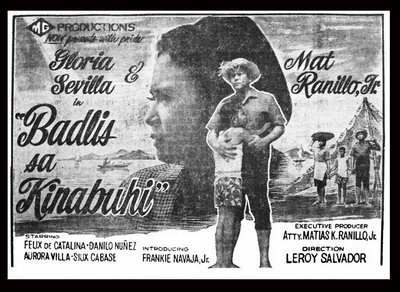 After a successful decade in the 1950s, with over 80 films produced in Visayan, Cebuano cinema was dormant for much of the 1960s, until interest in local productions was revived by this film featuring Gloria Sevilla and Mat Ranillo Jr. Though director Leroy Salvador made most of his movies in Tagalog, this foray into Cebu is rightly credited with breathing life back into the local industry. Here you can watch a clip from the film — as you can see, it could use some audio and video restoration as well, but at least it’s in circulation. Badlis sa kinabuhi won Best Black and White Film at the 16th Asian Film Festival in Jakarta, and won FAMAS Awards for Best Actress and Best Child Actor, besides being nominated for three more. This part-Cebuano film boldly delves into the internal conflicts of culture and politics in the Philippines, following a Manila documentary filmmaker’s fictionalized journey to Cebu to film the Sinulog Festival. He becomes sidetracked into a more sinister story when veteran politican Lito Caliso (played by Publio Briones III) begins to open up to him about his past, unearthing some of the skeletons in society’s closet. 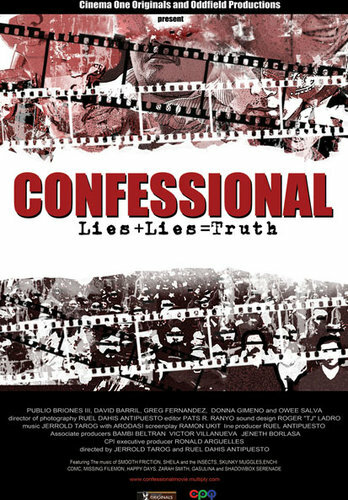 This hard-hitting mockumentary practically swept the Cinema One Originals awards as well as the PMPC Star Awards, also picking up prizes at the Cinemanila International Film Festival and the Osian Festival of Asian and Arab Cinema in New Delhi. As he did in his acclaimed short film To Siomai Love, director Zuasola tells his story in real time using only one long take, a technical challenge that has been taken up by many filmmakers lately, most successfully in Alexander Sokurov’s Russian Ark. 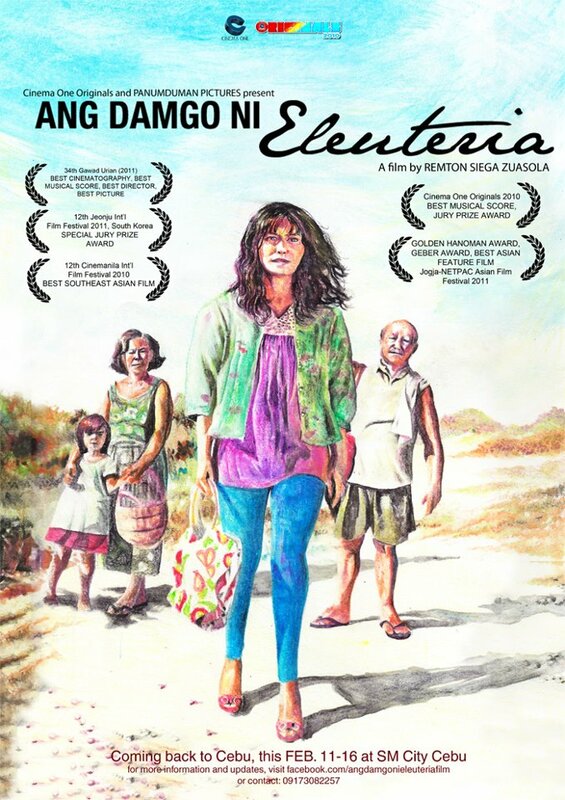 It can easily become a gimmick, but in Ang Damgo ni Eleuteria it suits the story, which is about a young lady deciding whether or not to leave her family to become a mail-order bride for a German man. Though sometimes, inevitably, the pace drags, this entry reaffirms the artistic ferment taking place in the Cebuano film world, and won Best Picture, Director, Cinematography, and Music at the Gawad Urian Awards, as well as the Jury Prize at the Cinema One Originals Film Festival and at Korea’s Junjeu Film Festival. There are many more fantastic Cebuano films being produced that I didn’t have space for here. I know there are many fans out there of Isang Tanong, Isang Sagot…or maybe Panaghóy sa subâ: The Call of the River was more your style? What are your favorites? Nadia Jones is a freelance blogger who is passionate about Arts & Culture. She’s also a strong supporter of online learning by encouraging those ones who cannot study through traditional means by enrolling in accredited online colleges. She welcomes your comments at nadia.jones5@gmail.com. I believe that Cebuano talents is on par with Manila talents, it just lacks exposure. Making a film industry in Cebu would be a great idea given that we have the budget and out local producers would support it. Thanks, I’ll be sure to check out this for! I’ve actually been wanting to check out movies from the Philippines. I remember hearing multiple people say they were bad source of movie but maybe that’s because they were comparing them to places like China & Korea.